HandKrafted by Stephanie: Taylored Expressions December Release Day! Hello! 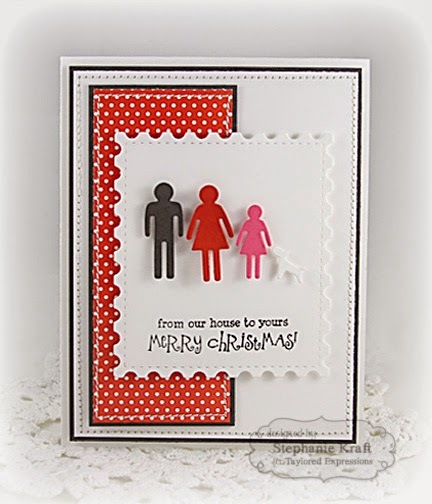 Welcome to Taylored Expressions December 2014 Release! All products that we have been peeking this week are now available in the TE store, HERE! Before you head off to shop, I have a few more cards to show you. 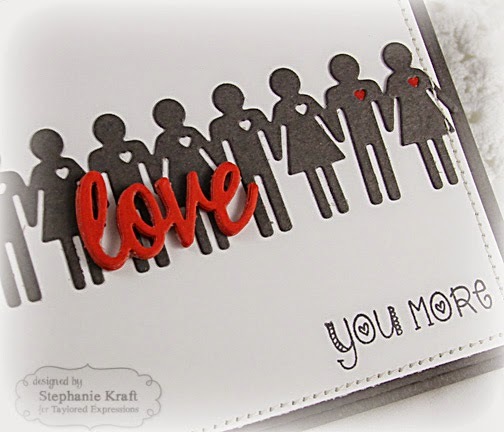 Next is a simple card using the Potty People Border and Love You More. Finally, there's Potty People! I love this sweet little die set as I am sort of addicted to adding potty people to my Pockets & Pages layouts. 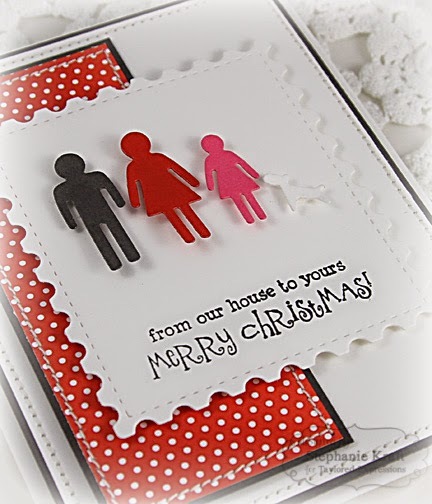 This time I added them to a card to make a simple Christmas card. My potty people represent Dan, me, Sabrina and our pup, Bella (she's a little hard to see since she's white on the white background, but she's there if you look closely). They are all popped up with foam tape. Accessories: Taylored Dies: Pieces of My Heart coordinating die (TE), Gold doily, Black embossing powder, Hemp cord, Wooden heart (Freckled Fawn), Foam tape, Thread, Sewing machine. 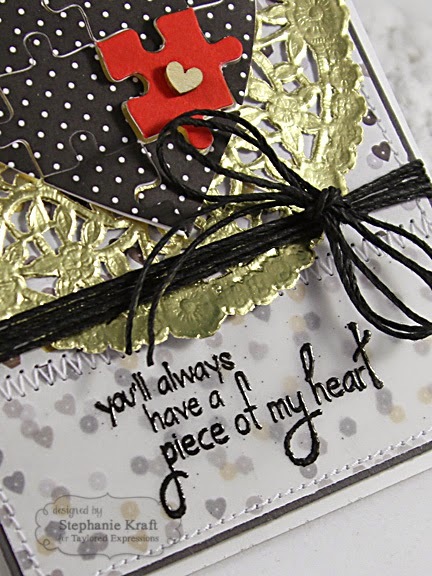 Accessories: Taylored Dies: Love You More coordinating die, Potty People Border (TE); Foam tape, Thread, Sewing machine. Accessories: Taylored Dies: Potty People, Postage Stamp Stacklets (TE); Foam tape, Thread, Sewing machine. Sweet cards Steph. 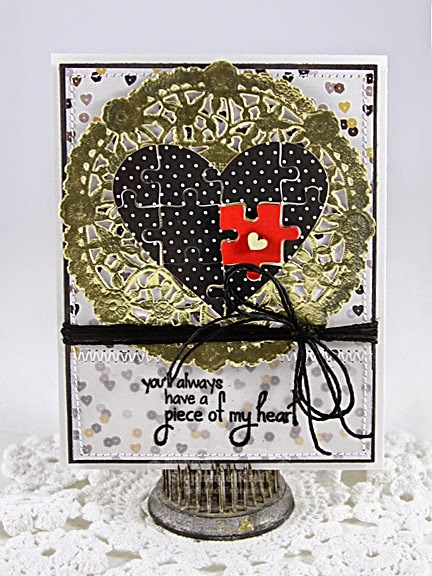 Love the heart puzzle with the gold doily. The potty people family is so adorable! 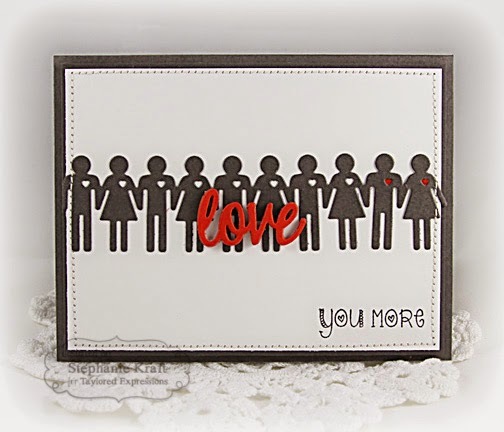 Super cute collection of cards Stephanie! Happy Holidays!